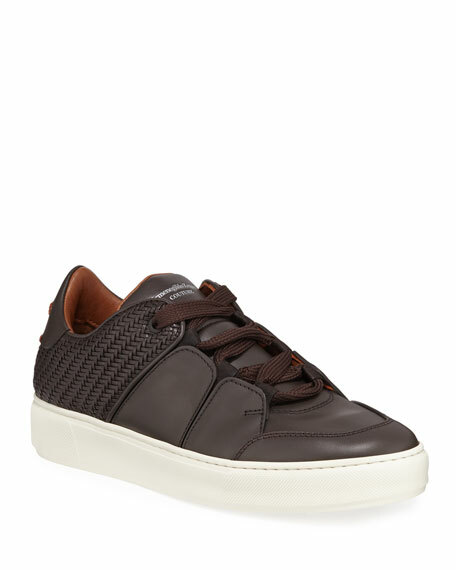 Ermenegildo Zegna sneaker in calf leather with woven panels. "Tiziano" is made in Italy. Ermenegildo Zegna "Cesare" hiking sneakers in multicolor calf leather and mesh. Reinforced round toe. Lace-up front. Embossed logo at vamp. 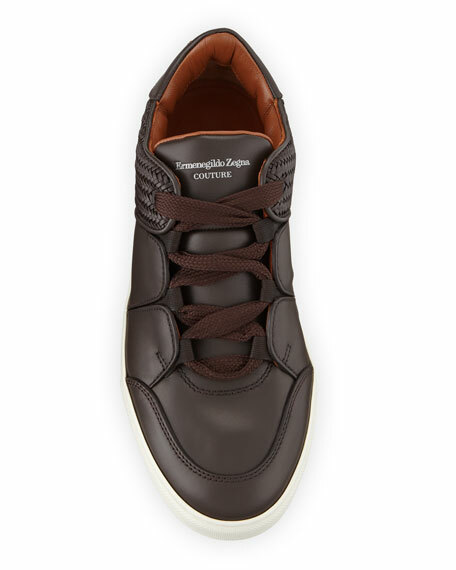 Ermenegildo Zegna "Cesare" hiking sneakers in multicolor calf leather and mesh. Reinforced round toe. Lace-up front. Embossed logo at vamp. Pull tab at backstay. Leather lining. Rubber outsole. Made in Italy. Ermenegildo Zegna Triple Stitch low top shoes in calf leather with suede detail. Round toe. Crisscross stretch vamp. Logo detail on back. Slip-on style. Rubber sole. Fabric/leather lining. Made in Italy. Fendi leather low-top sneaker with "FF" pattern trim. Round toe. Lace-up front. Logo-embossed tongue. Contrast heel counter. Nylon/polyester trim and lining. PVC embroidery. Rubber outsole. Made in Italy.